This is a very convenient recipe to half make-up in advance and then it only takes a minute or two to put it together in a slow-cooker on the day you want to eat it. I made my meatballs the day before, and stored them in the fridge to use first-thing in the morning. I was a bit unsure of the ingredient 15oz can tomato sauce so I substituted with half a tube of tomato paste and it worked well. Heat olive oil and minced garlic on medium heat in a fry pan. Add onion and sauté until onions become translucent (about 5 – 7 minutes). In a processor, or large bowl, add turkey, egg, almond flour, Parmesan cheese, milk, Italian seasoning and sautéd onions. Mix all ingredients until completely combined. If not using a processor, use your hands. Roll the mixture into balls (2” or slightly less in size) and place on some parchment paper. Heat a little oil on a medium low heat in a pan. Place meatballs in the pan and brown each side. Set aside. Prepare the sauce directly in the slow-cooker. Place onion, crushed tomatoes, sauce, fresh basil leaves and dried herbs in the cooker and stir well. Add the meatballs and gently stir the meatballs into the sauce until each one is covered. Eat with spaghetti squash, spaghetti noodles, courgette noodles, over vegetables, or just plain. Our verdict: the best meatballs we have ever tasted !! 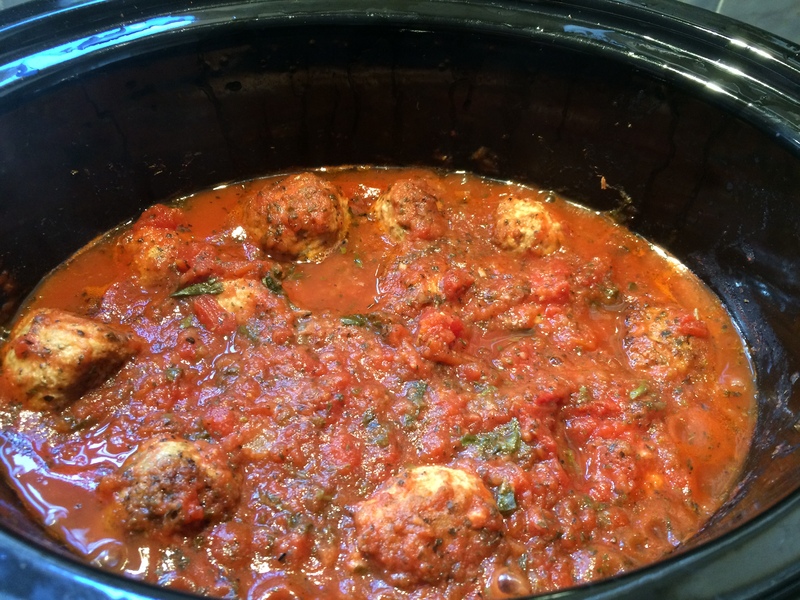 This entry was posted in Dinner and tagged Cooking, Dinner, Gluten Free, Healthy Eating, Meatballs, Recipes, Supper, Tomatoes, Turkey, Wheat-Free. Bookmark the permalink.